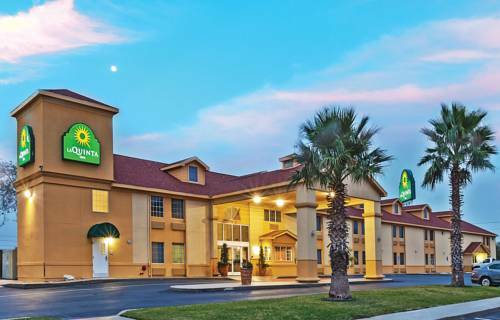 Conveniently located just six miles from downtown and off of IH-37, the newly renovated La Quinta Inn San Antonio Brooks City Base is the perfect place to stay for those visiting the Historic Alamo, World-famous River Walk, Market Square, Alamodome or AT&T Center. With convenient access to all major freeways, a short drive will get you to places like SeaWorld San Antonio, Six Flags Fiesta Texas, and Calaveras Lake. One of San Antonio's newest shopping centers, City Base Landing, is right next door, and other malls like Northstar, Ingram Park, Crossroads, and South Park are easily accessible from the Hotel. The courteous staff at the La Quinta Inn San Antonio Brooks City Base provides a warm and inviting atmosphere and loads of amenities to make your stay most enjoyable. Stay refreshed in the hotel's sparkling outdoor pool, and wake up to a Free Bright Side BreakfastTM each morning featuring Texas shaped waffles, hard-boiled eggs, assortment of fruit, cereal, breakfast breads, juice and coffee. There is no doubt that you will wake up on the Bright Side after a restful night's sleep in our comfy pillow-top beds. At the La Quinta Inn San Antonio Brooks City Base our guestrooms also feature complimentary Ultra-Fast wireless Internet access, Plug & Play flat panel HD TVs, microwaves, refrigerators, iron & ironing board, individual cup coffee makers, work desk, and many other amenities. All reservations must be canceled 24 hours prior to your scheduled date of arrival to avoid being charged one night's room rate plus all taxes. Exceptions may apply during holidays and special events. - San Antonio Paper Inc.